Do you use a serum in your skincare routine? It’s not something I used to do, but a few years ago I realized that it’s a great way to add an extra care to your routine without having to change your main products. For example my focus used to be on oil control, but I also wanted to start incorporating anti-ageing care into my routine. By adding a serum with anti-ageing benefits I didn’t have to switch my cleanser or moisturizer. And I can switch my serum depending on what skin problem I want to target. Sometimes I’ll even use two serums depending on what they do. 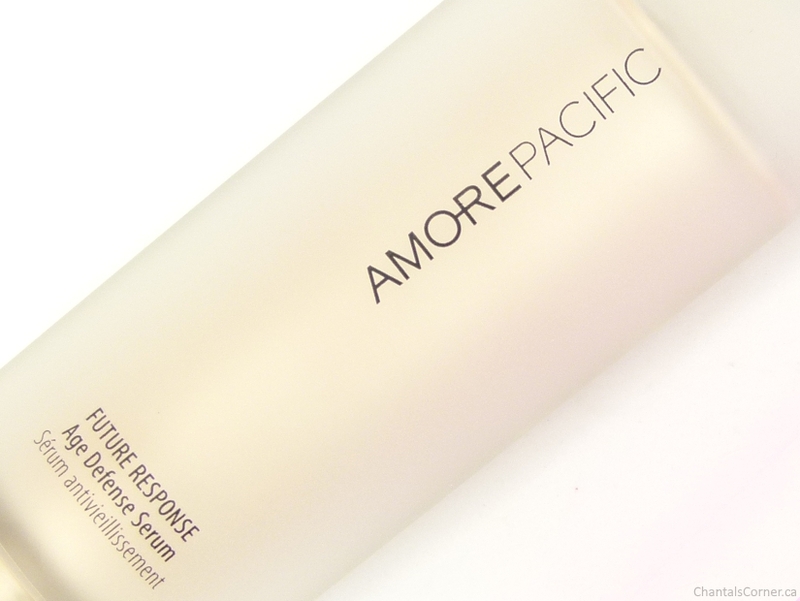 The latest serum I’ve been using is the AMOREPACIFIC Future Response Age Defense Serum ($176 CAD/$160 USD), which is also my introduction to the AMOREPACIFIC brand. 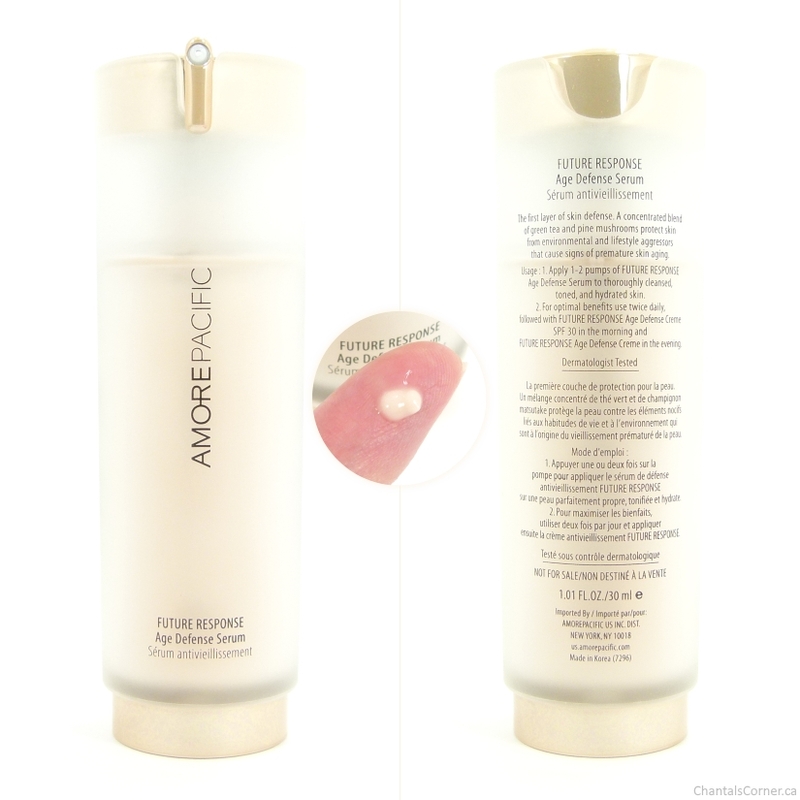 The AMOREPACIFIC Future Response Age Defense Serum is described as a concentrated blend of green tea and pine mushroom helps to protect the skin from environmental and lifestyle aggressors that cause signs of premature skin aging. I’ve tried a few serums in the past and this is the first one I try that feels moisturizing. Most serums will absorb really fast, but will not offer any type of moisturization to my skin (I’m just talking about the ones I’ve tried before, not ALL serums). This one does which I really like. In the morning when I shower, washing my face is the last thing I do before I step out of the shower because by the time I get out, dry myself and apply my face products, my face usually feels quite dry and tight. Most serums will give me a few seconds of relief, but my skin is just screaming for moisturizer by the time I’m done applying it. My daughter often wakes up while I’m in the shower, but before I go get her I HAVE to moisturize. With this AMOREPACIFIC Future Response Age Defense Serum I can apply the serum, go get my daughter and come back to moisturize – my face never feels dry or tight. My skin doesn’t feel dry or tight like it usually does with the other serums I’ve used before. I also quite enjoy the scent of this serum. It is a bit perfumy, but I find it luxurious. I won’t lie, back in my 20s I probably would have described this as a granny scent, but now that I’m getting… wiser (ahem 😉 ), I’ve grown to appreciate this kind of scent. There really is something luxurious about this serum, both in scent and texture. It melts to the touch (as you can see it sliding down my finger in the picture above) and absorbs quickly into the skin leaving it feeling soft and smooth. I use one pump for my entire face, and use it morning and night. My face has been feeling nice and plump since I’ve been using this serum. Even though it’s moisturizing and I have combination skin, I don’t find that my face gets oily faster with the added moisture – which is something I worried about when I first started using it. What serum are you currently using? Have you tried products from AMOREPACIFIC?